Looks like Greenpeace is playing their games again. 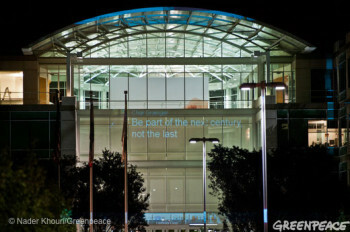 This time it was a demonstration at Apple’s Headquarters in Cupertino that saw images being projected onto Apple’s main campus building. If the shelter thing wasn’t enough, Greenpeace members dressed up as iPhones and marched around displaying messages from their supporters via Facebook and Twitter (this whole thing resembles a circus event if you think about it). Apparently over 215,000 people have signed the group’s “Clean Our Cloud” petition that asks Apple to to use clean energy for its iCloud service. However Apple has taken measures to ensure it uses clean and renewable energy. These efforts have been seen in the company’s Prineville, Oregon facility and Maiden, North Carolina facility, the former of which will use 100% renewable energy.